A Crown Estate scheme set to replace 1950s block on Piccadilly with taller office-led development designed by Architects DSDHA. Airwork House at 35 Piccadilly is an office building in Mayfair. The Crown Estate will demolish the current building and build a new one designed by DSDHA. In March 2018 Planning permission was granted for an application submitted in December 2017. The South Molton Street Building is a new mixed-use development located on Oxford Street, London’s busiest shopping thoroughfare, at the junction with South Molton Street and Davies Street. It is adjacent to Bond Street Underground Station, which will benefit from the arrival of Crossrail in 2018 and an influx of additional visitors to the area. The development replaces a former pub with a new high quality mixeduse building comprising retail, office space and residential. The six-storey building is the brand headquarters and flagship store for Bosideng, China’s largest retailer (which has over 4000 outlets in China), introducing the brand to an international audience. Both Christ’s College Secondary School and Pond Meadow Special Needs School have been designed to create a new educational campus, along with the existing Guildford Children’s Centre. The project was commissioned by Surrey County Council and the Diocese of Guildford and led by architects DSDHA with the Design and Build Contractor, Wates Construction Ltd. Pond Meadow School is one of seven projects in the South East region to be awarded one of this year’s RIBA Awards. The previous Pond Meadow School site lacked any civic presence, hemmed in by neighbouring residential developments, and the school consisted of a number of adjoining and detached single-storey buildings and pre-fab classrooms set around tarmac play areas. The building stock was unsuitable for the specialist needs and equipment necessary in this type of school. 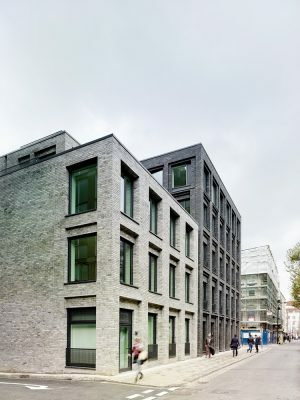 DSDHA was established by Deborah Saunt and David Hills in 1998, and in 2010 they were shortlisted for the RIBA Stirling Prize for Christ’s College, Guildford, as well as being named Architect of the Year and Education Architect of the Year. Their work blurs the boundary between architecture, landscape and urbanism, and is best known for its innovative approach to sustainability and public engagement. Their projects have been recognised with ten RIBA Awards in the last decade, and they have twice been nominated for the Mies Van Der Rohe Prize for Contemporary Architecture. Recent projects range from a gateway building for London’s Olympic Village, a flagship store in the West End and a new studio for writer and artist Edmund de Waal. In addition, DSDHA has been involved in significant urban design proposals including the redesign of Parliament Square with Foster & Partners, improvements to the public realm between The Albert Memorial and The Royal Albert Hall, as well as urban regeneration projects for Waterloo and Vauxhall Pleasure Gardens. Deborah and David also lead the studio’s urban research, regularly writing and broadcasting on architecture, and have taught widely including at EPFL (Lausanne), University of Cambridge, AA, RCA and currently Cass School of Architecture. March 25, 2018 in Architects.